“… how did you decide that I was a Reconstructionist Rabbi? I’d like to give you a comprehensive response, for two reasons: 1. I am very interested in how you incorporate Logotherapy into your Judaism, and 2. (which is pertinent to your question) in your “About” on your site you don’t come across as a Reconstructionist Jew, but in much of what you say in your “Disillusionment” post you do come across as one, and in one instance as a mirror image of one. For now, let me explain why you are a mirror image of a Reconstructionist. I will give you a more comprehensive reply in my next post or two. For now, a Reconstructionist Jew believes that God is a piece of our souls, whereas you, in your “Disillusionment”, believe that our souls (neshamos) are a “a piece of G-d Above”. “Tradition tells us that the Torah was dictated by God to Moses, and then transmitted through the generations. Reconstructionist Jews see the Torah as the Jewish people’s response to God’s presence in the world (and not God’s gift to us). That is to say, the Jews wrote the Torah.” (My underlining). I don’t think Tani Burton believes that the Torah is (purely?) man-made. His post on “Jewish disillusionment” does, happily, give me some idea of his Jewish beliefs. In his post, he is dealing with the disillusionment that many Jews must have felt with Jewish leaders who had – or appeared to have – gone astray. Retreating into the psychoanalytical shelter of a mechanistic view of people, one might simply dismiss these cases of corruption as manifestations of primal human drives towards lust or power. After all, these people are just human. Logotherapy gives us a new vocabulary to combat this dim view of humanity. There is no “just human”! In the words of Victor Frankl, “no one will be able to make us believe that man is a sublimated animal once we can show that within him there is a repressed angel.” (Frankl, Man’s Search for Ultimate Meaning, 2000) A human being is not merely a higher primate who is simply predetermined by his drives, but is rather a majestic being who, when he rises to “full human stature”, he is recognizably created in the image of G-d. The aforementioned statement perfectly sums up an idea in Logotherapy, that one can and must take a defiant stance against meaninglessness. We can take such a stance by remembering the following three things. First, G-d is eternal and unchanging. He is the Source of everything, all holiness, and all purity. He remains unaffected by the corruption that has reared its ugly head down here. His Torah is not defiled. Second, our neshamos (souls) are holy and pure, and they remain so no matter what, being as they are “a piece of G-d Above”. Third, Eretz Yisrael remains precious, holy and pure. It is G-d’s land, and we have been invited to dwell in it. It cannot be defiled by a corrupt government, no matter what. Let us be defiant against the devolution of values and meaning, and not allow ourselves to become jaded, desensitized and sarcastic. We can still connect to G-d, to our souls, to the Holy Torah, and to the Holy Land. End of Tani Burton’s excerpt. There are Jews such as the Ropshitz dynasty (see also the “Ropshitzer Rebbe”) who became famous for seeing God in everything. The Torah says the opposite. I wonder why the Jews excommunicated Barnum Spinach for saying that God was in everything. I suppose because he saw the contradiction between being a pantheist (pantheistic?) and a believer in Genesis 1:1: In the beginning, God created the heavens and the earth, and opted not to live a double life. Tina Burton’s first rule of comfort is: “First, G-d is eternal and unchanging. He is the Source of everything, all holiness, and all purity.” This is the same G-d that Tina Burton says we are all a “piece of,” which, although is not the same thing as saying that humans and G-d are all “of a piece”, does sound like seeing God in every person, if not in every thing. To see God in everybody, isn’t that the same as seeing God incarnate in everyone, or if that is going to far, a piece of God incarnate in everyone? I wonder about that. The Tanaka is a long litany of defilement of the land. Why, because of the people in it, whose whoredoms (זנותים znutim – mentioned more than 30 times in the Tanakh) the Holy One of Israel, their “husband” had to endure. The books of Ezekiel, Hosea, Nahum, and on and on are bursting with the defilement and corruption of God’s chosen people, and ipso facto defilement of the land. How is the “land”, that is, the people of Israel different today? No different. No different from the whole earth. But, I must leave “the land,” because the main question that concerns us here is the compatibility of Logotherapy with the God of the Torah. In the light of the above points, I now contrast Torah Judaism with Logotherapy’s (Frankl and Tani Burton) idea on spirituality. There are other movements in Judaism such as Reconstructionist Judaism that are far removed from Torah Judaism. and which share many of Frankl’s ideas on spirituality. See my “The spirit of reconstructionist Judaism,” “Tefillin: the seal of love as strong as death”, “God in Viktor Frankl’s logotherapy”. Frankl’s religion is “broader” than most, including Judaism. Frankl’s god is the god of the heart. In Judaism, the “heart” (the deeps of thought and feeling) is a vital organ, but it is not where God originates nor where He ends. The Torah God is a terrible – yare יָרֵא – majesty (Job 37:22). (Unfortunately, the original meaning of “terrible” has been watered down to mean “horrible”, which itself has been watered down to mean “so very not nice”). “Ein-sof (literally the “Endless” one – so, no beginning and no end) begets a world so that He, as the source of all meaning and value, can come to know Himself, and in order for His values, which in Him exist only in the abstract, can become fully actualized in humanity.Ein-sof is both the fullness of being and absolute nothingness, but is not complete in its essence until He is made real through the spiritualizing and redemptive activity of mankind (my underlining). Is this God in Isaiah one who is “not complete in its essence until He is made real through the spiritualizing and redemptive activity of mankind” (Kabbalah passage above). Am I hearing things? God is waiting for mankind to redeem Him” It’s so very not like the Judaism of the Bible. Send him to tell the people what? So, LORD, you’re always talking about remnants; can we at least expect you to guard the status quo and not evolve into something we can’t deal with? Sorry, not this time. This is not Viktor Frankl’s God. The 4th point in Frankl’s view of spirituality. The Holy One of Israel is never unconscious; he doesn’t even take forty winks. I’m reminded of Heidegger, Sartre, Spinoza and so many more philosophers, which I poured over during my years of philosophy studies at the University of Cape Town. No Torah Jew, not even a Reconstructionist Jew, would disagree with this one. In fact, only the most evangelical of atheists like Dawkins and Hitchins (Christopher, not Peter his brother) would rant about point 5. Of course, it all depends what you mean by “God.” For Frankl and Reconstructionist Jews like their founder, Mordecai Kaplan, “God” is a human creation. For a Kabbalist, God can find no rest for His soul until Kaplan or Frankl, or preferably someone alive makes a determined effort to redeem Him. And last but not beast, point 6. Frankl relates (in “Man’s search for ultimate meaning” 1975, p. 59) that some prisoners in he concentration camp came to realize that they were repressing the feeling that they were much more than animals, that there was something in them that transcended the flesh and the rational mind, a being struggling to burst out of the darkness, a “repressed angel.” The Freudian term or concept of “repressed” doesn’t exist in the Bible, whether in humans, angels or demons. Angels in the Bible, don’t get depressed or repressed. Demons, in the Torah, are fallen angels. Fallen and unfallen angels can never be human, except in the great man-made literatures of the world, where they not only consort with man, but are often a metaphor for man. You can find cohorts of repressed angels and demons cavorting through the works of Dostoevsky, Tolstoy, Hugo, Shakespeare, Baudelaire – and of course, everyone’s favourite, Dan Brown. None of these writers think that man himself can be a literal angel or a demon, though there’s nothing wrong with turning – though, it can be quite remunerative, as Dan Brown has proved – humans into repressed angels; or psychotic demons. Andrew Reid Fuller, in his “Psychology and religion: eight points of view,”, p. 266, says that “[u]nconscious religiousness is also found to break through unexpectedly in the lives of psychotics.” Unconscious religiousness can be found in anyone who feels some deep experience; a sunset, or, after arriving from a busy day at the office, plunging your face into a warm froth of kitty fur. But seriously, if one really believes the Bible to be God’s revelation, I can’t see how one can reconcile it with Logotherapy. Logotherapy fits the world like a warm glove; the Bible, like a soggy sock. Frankl gives the world what it wants, what it needs, what it wants to need. Meet clients, patients, parishioners where they are at. If they like talking Torah, encourage them to make the best of it. Logotherapy and Torah Judaism have very little logos (meaning) or therapia (methods of cure) in common, and in many ways the one is a distorted image of the other. In a similar way Reconstructionist Judaism is a distorted image of Torah Judaism. Logotherapy and Reconstructionism are in essential agreement. One may object that they are different because Reconstructionism is about the meaning of being Jewish, whereas Logotherapy is about the meaning of being human. What do I mean, then, when I say that Reconstructionist Judaism is, in essence, similar to Logotherapy? I mean that they both believe that “God” is of human origin. There is, however, this difference between them. In Reconstructionist Judaism, the Jew creates “God”; in Logotherapy, man is a repressed angel . Tani Burton agrees that man is a repressed angel, but he also said (at the beginning of this piece) that “when [man] rises to “full human stature”, he is recognizably created in the image of G-d.” But we saw that for Frankl this repressed angel is not only man himself but “may justifiably be called God” as well (Frankl). A trinity of three persons: man, angel and God, all sharing the same essence or nature. Ultimately, in Logotherapy, man is not “just human;” far from it. For the Logotherapist, there is no Being more ultimate than man, who, with the will to mean good can become a Man-God. Ultimately, in Torah Judaism, there is no Being more ultimate than the Creator God of Abraham, Isaac and Jacob, who fashioned man from the dust and breathed into him a living soul. Two radically different and irreconcilable views of God and man. But, no, says man, not necessarily irreconcilable, for what is impossible to God is possible to man – a mirror image of “what is impossible to man, is possible to God.” The reader may ask: Where in the Tanakh can look up this last quote?” It’s not in the Tanakh, dear reader, I can Luke it up for you in my New Testament; while you’re waiting, I can tell you that they are the words of another God-Man, the real Mckoy. “Precious יָקָר (yakar) in the sight of the Lord is the death of his godly ones לַחֲסִידָֽיו (lechasidayv – from which we get “chassid”). Christians would say that Christ is precious (yakar) because he was pierced (דקר daqar – in Jeremiah 12:10; ). Jews will say that “pierce” in Jeremiah 12:10 refers to the “stabbing”, “thrusting through” of Israel? of unbelievers?, which will occur when Messiah comes at the beginning of the Messianic age. Whatever way you cut it, suffering attracts deep respect and, in case of Frankl’s suffering, almost awe. This is what may attract religious people to Frankl’s Logotherapy: He’s deep; mainly because he has suffered more than any of the religious people who read him. Beauty is truth and truth is beauty, says Keats. What is truth? Pilate asks Jesus, and then promply? walks out (John 18:38) . But many people claim to know the answer. Suffering is truth. It seems that for followers of Frankl, suffering is truth and truth is suffering. The more you suffer, the truer you are. Truth comes through suffering, through grief, through affliction, through sorrow (Yiddish tsores) Aren’t the former major biblical themes? Therefore, think Frankl, think tsores, much tsores; and think tsores, think truth. (See my “The seal of truth as strong as death”). In Hebrews 2:18, we read “For since He Himself was tempted in that which He has suffered, He is able to come to the aid of those who are tempted.” Christians make the link between the suffering of Jesus and the suffering of Frankl. Who, in Christian eyes, has the greatest claim to truth, the most right to say “I am the way and the truth and the life”? Christians will say, Jesus. Was it because He suffered more than any human being could suffer? No, that is not the main reason. The main reason is because it was Truth, itself, Himself, that suffered. What makes Jesus’s suffering so unique was not the degree of suffering, but the kind of suffering, that only the True Son of God could seal: “The seal of G-d is Truth.” – Rabbi Hanina, Babylonian Talmud. Could it be that Christians and Jews are attracted to Frankl, not so much because he suffered so much, but because he dislocated the God of compassion from the God of wrat. More, because he replaced the God in the Heavens with a god in the heart? I am the captain of my fate, I am the captain of my soul. Mandela never discussed his religious beliefs. What is certain – if the last two lines of Invictus be indeed his leitmotif – is that, with Henley, he did not believe in the God of the Bible, and with Henley also shared a stoic resolve to rise above “the clutch of circumstance” and ”the bludgeonings of chance” to try to become the master of their fate, the captain of their souls. In the New Testament, there is a very different kind of captain, the Captain of salvation. ”For it became Him, of whom are all things, and by whom are all things, to make the Captain (Greek: archigos) of our salvation perfect through sufferings” (Hebrews 2:10). “In a last violent protest against the hopelessness of imminent death, says Frankl, I sensed my spirit piercing through the enveloping gloom. I felt it transcend that hopeless, meaningless world, and from somewhere I heard a victorious “Yes” in answer to my question of the existence of an ultimate purpose. At that moment a light was lit in a distant farmhouse, which stood on the horizon as if painted there, in the midst of the miserable grey of a dawning morning in Bavaria. “Et lux in tenebris lucet”—and the light shineth in the darkness” (Man’s search for meaning, pp. 51-52). (See my The Light shineth in the darkness, but did Viktor Frankl comprehend it? Man, therefore, according to the Bible is not the captain of his soul – God is. Frankl and Mandela’s light did shine in their darkness, but they did not understand – their darkness. The Light shineth in the darkness, but did Viktor Frankl comprehend it? “One must be fond of people and trust them if one isn’t to make a mess of life, and therefore it is essential that they shouldn’t let one down. They often do. The moral of which is that I must be as reliable as possible, and this I try to be…. [Reliability on a personal level] is a matter for the heart, which signs no documents. In other words, reliability is impossible unless there is natural warmth. Most men possess this warmth, though they have often had bad luck and get chilled. Most of them, even when they are politicians, want to keep faith. And one can, at all events, show one’s own little light here, one’s own poor little trembling flame, with the knowledge that it is not the only light that is shining in the darkness, and not the only one that the darkness doesn’t comprehend” (p. 95-96, in “I believe: The personal philosophies of twenty-three eminent men and women of our time.” Fifth Impression 1952; originally published in 1940). Havelock Ellis believed in the essential goodness of man, in the good will of man, which, if not for the “bad luck” of darkness would have made the world a much more enlightened and warmer place. One must not give up. Enlightened individuals can, and must, in their small way shine their light before men, dim as it may be, even if the darkness comprehends it not, in the hope that, by some stroke of luck, we may light up a corner of that darkness. Why should I live only to suffer in this world? I survived three years of starvation and torture. All I did was suffer a lot and…for what? I didn’t think it likely I would survive until liberation. But, my friend, life was still worth living. But that was enough to give meaning to life. Why shouldn’t suffering be part of our humanity? Oh, I’m sure you mean well, Doc. While mine comes from inside and..is caused by what? Something must be terribly wrong with me, right? And, Doc, don’t just say it’s my imagination. I’d like to live if I only knew how. So, tell me, is there a grand meaning of life for me? Or am I destined to keep being a screw-up? But man’s search for meaning is never finished. Your life will change as will its meaning, that’s what. look to your future, not to your past. meaning will then find you instead, okay? You’ve got a conscience that shall guide you through life. Has Dr Freudine captured the essence of Frankl? Is there more – besides all the philosophy and psychology – to Frankl than inner strength? After reading his inspiring and heartrending account of suffering, courage and hope, I have come to the sad conclusion that although he saw the light shining in the darkness, he didn’t comprehend it. The “bottom line” for Dr Freudine is that “Frankl’s religion was important to him, but he quoted existentialists and psychiatrists, not scripture; for example, Nietzsche: “If you know the why of life, you can bear any how of life.” Dr Freudine is right and she is wrong. Frankl did quote Nietzsche but he did quote scripture as well; the very Bible verse that seemed to indicate that he had discovered the “why” of life, and, therefore, was able to bear any “how” of life. “Et lux in tenebris lucet”—and the light shineth in the darkness. “Another time we were at work in a trench. The dawn was grey around us; grey was the sky above; grey the snow in the pale light of dawn; grey the rags in which my fellow prisoners were clad, and grey their faces. I was again conversing silently with my wife, or perhaps I was struggling to find the reason for my sufferings, my slow dying. In a last violent protest against the hopelessness of imminent death, I sensed my spirit piercing through the enveloping gloom. I felt it transcend that hopeless, meaningless world, and from somewhere I heard a victorious “Yes” in answer to my question of the existence of an ultimate purpose. At that moment a light was lit in a distant farmhouse, which stood on the horizon as if painted there, in the midst of the miserable grey of a dawning morning in Bavaria. “Et lux in tenebris lucet”—and the light shineth in the darkness (pp. 51-52; Frankl’s italics, my emphasis). “Let me explain why I have employed the term “logotherapy” as the name for my theory. Logos is a Greek word which denotes “meaning.” Logotherapy, or, as it has been called by some authors, “The Third Viennese School of Psychotherapy,” focuses on the meaning of human existence as well as on man’s search for such a meaning. According to logotherapy, this striving to find a meaning in one’s life is the primary motivational force in man. That is why I speak of a will to meaning in contrast to the pleasure principle (or, as we could also term it, the will to pleasure) on which Freudian psychoanalysis is centred as well as in contrast to the will to power on which Adlerian psychology, using the term “striving for superiority,” is focused” (Fankl’s italics). Logotherapy also teaches that all things work for good; there is, however, no outside Force (personal or impersonal) that is pulling at one’s heartstrings. In logotherapy, we pull our own strings and pick ourselves up by our own bootstraps. There is no meaning – ethical, epistemological or ontological, or religious meaning – outside man. First to Bulka’s Abstract. He says that Frankl rightfully insisted that logotherapy is secular in theory and in practice, yet because logotherapy straddles medicine and religion, it appeals to religious groups. In spite of the fact (insisted upon by someone with the most authority to do so; Frankl, himself) that logotherapy has nothing to do with religion, and “rightly” so (Bulka’s word in his Abstract above), Bulka insists that logotherapy (which is Frankl’s logotherapy) has religious overtones. There’s more. Owing to Bulka’s “fact” that logotherapy strays into religion, religious groups have transplanted it into their systems, and are making hay of it – and out of it. Religion, of course, involves man, but so do medicine, the human sciences (for example, psychology, sociology, anthropology) and the humanities (for example, history, philosophy, literature). What makes religion different to the human sciences and humanities is that religion involves the vertical dimension of “God.” In logotherapy you are responsible only to yourself and to others. In logotherapy, freedom is, like the air we breath, a given; given by nature, not God. But to make right use of it, we have to work at it, and when we do freedom becomes more than a “given”; it becomes a “taken”. We’re not, as in the Freudian system, a victim of drives, or a victim of circumstances. The only “religion” that I observe in logotherapy is a modicum of religious imagery (for example, “the light shines in the darkness”) and religious terminology (for example, “saint”), and a reference to the Lord’s prayer (“Our Father who art in heaven) – all Christian references (perhaps the Catholicism of his second wife was an influence). Jews and Christians may object that I underestimate logotherapy and them; there is far more, they may argue, to logotherapy than Frankl’s rare forays into religious symbolism. “What makes logotherapy so interesting to us,” religious people may say, “is that it shares with religion notions such as the will to mean, selflessness, responsibility and the “courage to be” (the title of a book by Paul Tillich). These notions, I would counter, are what makes us human, not what makes us religious. “In spite of all the enforced physical and mental primitiveness of the life in a concentration camp, it was possible for spiritual life to deepen. Sensitive people who were used to a rich intellectual life may have suffered much pain (they were often of a delicate constitution), but the damage to their inner selves was less. They were able to retreat from their terrible surroundings to a life of inner riches and spiritual freedom” (p. 47 of “Man’s search for meaning” ). The “spiritual life”, for Frankl, is the ability to retreat from the pain and feed off their inner riches. God has nothing to do with it. For the religious Jew (not as common a breed as non-Jews think), the overarching precept is Kiddush Hashem קידוש השם, the sanctification of the Name. This is done by becoming holy as God is Holy. In the sense of Kiddush Hashem religion there is no religion in logotherapy. There might be some religion in neo-logotherapy, if such an aberration exists, but not in Frankl’s logotherapy. This is what I think attracts religious people to Frankl (logotherapy): “He’s deep; mainly because he’s suffered more than any of the religious people who read him. Beauty is truth and truth is beauty, rhapsodises Keats. What is truth? Suffering is truth. (I’m speaking as an imaginary religious admirer of Frankl). In Frankl, suffering is truth and truth is suffering. The more you suffer, the truer you are. Truth comes through suffering, through grief, through affliction, through sorrow (Yiddish tsores) Aren’t these major biblical themes? Therefore, when we think Frankl, we think tsores, much tsores, and when we think much tsores, we think truth. Christians make the link between the suffering of Jesus and the suffering of Frankl. Who, in Christian eyes, has the greatest claim to truth, the most right to say “I am the way and the truth and the life”? Christians will say, Jesus. Was it because He suffered more than any human being could suffer? No, that is not the main reason. The main reason is because it was Truth, itself, Himself, that suffered. What makes Jesus’s suffering so unique was not the degree of suffering, but the kind of suffering, that only the True Son of God could seal: “The seal of G-d is Truth.” – Rabbi Hanina, Babylonian Talmud. Religion, of course, involves man, but so do medicine, the human sciences (for example, psychology, sociology, anthropology) and the humanities (for example, history, philosophy, literature). What makes religion different to the human sciences and humanities is that religion involves the vertical dimension of God. In logotherapy you are responsible only to yourself and to others. In logotherapy, freedom is, like the air we breath; a given. We’re not, as in the Freudian system, a victim of our drives, or, a victim of circumstances, as in a stimulus-response behaviourism (Thordike). We have the potential (freedom), as Frankl says, to become a swine or a saint. The use of religious terms such as “saint” in Frankl are deceiving. “Saint” is one of many religious terms and quotations that have been secularised into quips, as we do with Shakespeare, who, himself, drew on biblical language. Frankl’s use of “and the light shineth in the darkness” – profound as it may be to Frankl – is one example. I say this because, by quoting only half the verse, he has missed its point, and mutilated its tragic import. “In a last violent protest against the hopelessness of imminent death, I sensed my spirit piercing through the enveloping gloom. I felt it transcend that hopeless, meaningless world, and from somewhere I heard a victorious “Yes” in answer to my question of the existence of an ultimate purpose. At that moment a light was lit in a distant farmhouse, which stood on the horizon as if painted there, in the midst of the miserable grey of a dawning morning in Bavaria. “Et lux in tenebris lucet”—and the light shineth in the darkness (pp. 51-52). And Frankl comprehended it not. “May God be gracious to us and bless us and make his face to shine upon us” (Psalm 67:1). I mentioned in “God in Victor Frankl’s Logotherapy” that Frankl put on his Tefillin (phylacteries) every day. The Tefillin consists of two little back boxes (batim, plural of bayit “house”) each containing four sets Torah passages. The head bayit “house” (bayit shel rosh) has four separate compartments, one for each scroll, while the hand bayit (bayit shel yad) consists of only one compartment containing one scroll on which are written all four passages contained on the four separate scrolls in the head bayit. The head bayit is strapped just above the forehead (the cerebrum) and the other is attached to the left arm, which is placed near the heart. 4 Hear, O Israel: The LORD our God, the LORD is one. 5 Love the LORD your God with all your heart and with all your soul and with all your strength. 6 These commandments that I give you today are to be upon your hearts. 7 Impress them on your children. Talk about them when you sit at home and when you walk along the road, when you lie down and when you get up. 8 Tie them as symbols on your hands and bind them on your foreheads. 9 Write them on the door frames of your houses and on your gates. (My emphasis). Verse 8 refers to the Tefillin, and verse 9 to the Mezuzah, which I described in “Last will and Testament”. “I did not know whether my wife was alive, and I had no means of finding out (during all my prison life there was no outgoing or incoming mail); but at that moment it ceased to matter. There was no need for me to know; nothing could touch the strength of my love, my thoughts, and the image of my beloved. Had I known then that my wife was dead, I think that I would still have given myself, undisturbed by that knowledge, to the contemplation of her image, and that my mental conversation with her would have been just as vivid and just as satisfying. “Set me like a seal upon thy heart, love is as strong as death.” (My emphasis). Here is the passage in which “Set me like a seal upon thy heart, love is as strong as death” appears. 7 Many waters cannot quench love; rivers cannot wash it away. all the wealth of his house for love, it would be utterly scorned. ” Reconstructionist” and “Reform Jews” do not wear Tefillin because they don’t believe that Deuteronomy 6:8 “Tie them as symbols on your hands and bind them on your foreheads” is meant literally; consequently, they also do not believe that Song of Songs 5:8 Place me like a seal over your heart, like a seal on your arm” has anything to do with sealing the Torah in your hearts. For Reconstructionist and Reform Jews – and many modern Christians – the Song of Songs is read literally; it’s about love between a man and a woman. Frankl lies between the ‘fish’ of Jewish Orthodoxy and the ‘flesh’ of Jewish Reconstructionism; he puts on Tefillin (Orthodoxy) but does it not because he wants to “contemplate” (his term in his quote above) the Holy One of Israel but the image of his absent wife. Frankl’s book is about loving – not loving yourself, but the other. The Teffilin in the Torah is a command from God to build Him – who is both “Other” and “Husband” (Isaiah 62:5 -“And as the bridegroom rejoices over the bride, so shall thy God rejoice over you”) – a bayit and to guard it close to one’s mind and heart. 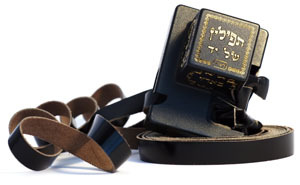 Frankl’s Tefillin, in contrast, seems to serve a different purpose: he has “reconstructed” and built himself another kind of bayit in which he binds himself with the cords of the Tefillin to the image of his beloved and seals himself up with a “love as strong as death” (Song of Songs 6:8b) within a bayit that no one can touch. “Do not let your hearts be troubled. Trust in God; trust also in me. In my Father’s house are many bayits; if it were not so, I would have told you. I am going there to prepare a place for you” (John 14:1-2). Frankl, Jossl and Voltaire make the best of it. “Let us ask ourselves what should be understood by “a tragic optimism.” In brief it means that one is, and remains, optimistic in spite of the “tragic triad,” as it is called in logotherapy, a triad which consists of those aspects of human existence which may be circumscribed by: (1) pain; (2) guilt; and (3) death. This chapter, in fact, raises the question, How is it possible to say yes to life in spite of all that? How, to pose the question differently, can life retain its potential meaning in spite of its tragic aspects? After all, “saying yes to life in spite of everything,” to use the phrase in which the title of a German book of mine is couched, presupposes that life is potentially meaningful under any conditions, even those which are most miserable. And this in turn presupposes the human capacity to creatively turn life’s negative aspects into something positive or constructive. In other words, what matters is to make the best of any given situation.” (My emphasis). In my post “The Eternal, History, and Reform Judaism”, I mentioned Voltaire’s novel “Candide, or Optimism,” usually referred to by the shorter title “Candide”. I gave the full title because it links in with Frankl’s “optimism” (in his paragraph above). In “Candide”, the main characters experience all the great horrors of the few centuries of European history before 1759 (the date of publication of “Candide”). The final horror was the great earthquake and tsunami that devastated Lisbon in 1755; an event that shook the faith of many Christians, as the Holocaust shook the faith of many Jews about two centuries later. Today most Jews remain on shaky religious ground1 One compensation – many Jews would say a new start – is that they can now do their shaking on perhaps more solid ground – the Land of Israel. If Voltaire lived after 1945, he would have included the Jewish Holocaust as one of these main horrors. Victor Frankl didn’t only live through the Holocaust, he was a prisoner in four concentration camps, and his family was killed in them. Where Voltaire is biting, Frankl is heartrending; where Voltaire is satirical, Frankl is (in his words above) “positive and constructive.”In the last few lines of “The case for tragic optimism” (p. 154), Frankl admonishes us once again to do our best: “… the world is in a bad state, but everything will become still worse unless each of us does his best.” That is the common thread running through all forms of Judaism and all kinds of Jews – and all mankind, “responsible” mankind, Frankl would say. If I read Tani Burton correctly, his reaction is the opposite of mine, which is: What, a Jew! By Jew, I mean – and I think Tani Burton means – a very religious Jew. “… the world is in a bad state, but everything will become still worse unless each of us does his best.” That is the common thread running through all forms of Judaism and all kinds of Jews – and all mankind, “responsible” mankind, Frankl would say.